We provide orthodontic care for pets. Braces are orthodontic appliances used to reposition teeth that are improperly aligned or mal-occluded. The initial oral examination involves a bite or occlusal evaluation. If the bite isn't right, consideration is focused on whether the bite is functional and comfortable. When the occlusion causes trauma, we refer to it as a traumatic occlusion. The consequences of traumatic occlusions can be substantial. Teeth striking teeth or soft tissues may result in tooth fracture, tooth inflammation (pulpitis), periodontal inflammation, pain and death of the tooth (non-vital tooth). Traumatic malocclusions can contribute to the development of periodontal disease and as stated above, non-vital teeth. Anachoresis is a term used to describe the spread of bacteria through the blood stream. Anachoresis is a major reason for the spread of infection from non-vital (dead) teeth and infections around the teeth (periodontal disease) to important organs such as the heart, kidney or liver. Malocclusions should be evaluated carefully to ensure pets have comfortable, functional bites, and to avoid serious consequences from the spread of bacteria. Braces are not appropriate for all faces! Orthodontic care is an advanced veterinary dental discipline. The fundamental principles and orthodontic techniques are complicated by the variety of facial shapes in veterinary patients. 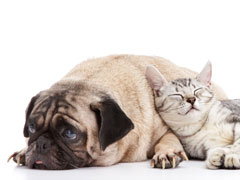 Think about the variety of cat and dog breeds. Some breeds have long narrow noses (Borzoi or Saluki), some shorter wide faces (Boxer or Basset), the mid length noses (German Shepherd) and others with very short noses (Himalayan, Pug). 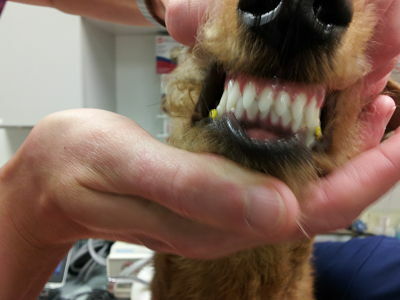 Clinical experience is mandatory to manage orthodontic cases for the veterinary patient. The veterinarian and client relationship is critical to a successful outcome! Ethical considerations are very important to Dr. Kressin! Altering the appearance of an animal for deception is never appropriate. Altering the occlusion to provide a comfortable and functional bite is appropriate, but not always a simple procedure. At times it might not be practical, or even possible to perform. The benefits from orthodontics can be tremendous for the pet. 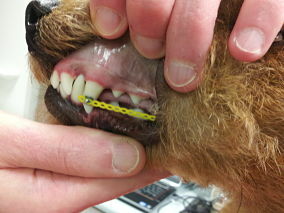 Consideration of the pets' temprament is very critical in the determination of whether braces are appropriate for a pet. Will the animal tolerate an orthodontic appliance? Is the pet an aggressive chewer, and how will restriction of this behavior affect the pet? Is orthodontic care or dental extraction best for the pet? 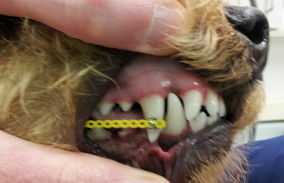 Consideration of the owners' expectations, needs and time limitations are important determinants on whether braces are appropriate for a pet. Orthodontic care requires frequent occlusal evaluations. Does the owner have the time for multiple visits required? It is important to clearly understand the procedural risks associated with orthodontic care, to establish realistic expectations and to discuss the prognosis. We provide an initial orthodontic consultation to perform an initial occlusal evaluation, discuss all concerns, and help with treatment planning. Complicated orthodontic procedures may be unrealistic when simple dental extractions can provide a functional and comfortable occlusion, with one anesthetic period. malocclusion not easily treated with lower canine teeth. At what age is orthodontic therapy appropriate? Age is an important consideration in the determination of treatment options for malocclusions. Interceptive orthodontics is a selective dental extraction technique used in an attempt to prevent macocclosion of the secondary (adult) dentition. There are cases where interceptive orthodontics are performed during the primary (baby) or mixed (both baby and adult) dentition to avoid or "intercept" problems with the secondary (dentition). The same patient may later require active force or passive force orthodontic appliances (braces). Chronologic age does not always correlate with tooth development. This is especially true with the wide variety of companion animal breeds we work with. The development may not even be the same for all areas of an individual pet. To evaluate for tooth development, dental radiographs are essential. The application of appropriate orthodontic forces differ at various stages of tooth development. Dental radiographs may be used in part to determine whether orthodontic care is appropriate, and when it should be started. What age is the occlusal evaluation performed? It is ideal to evaluate a patient as early as possible with a malocclusion. Waiting for the patient to "grow out of the problem" may allow for the problem to progress, and may eliminate less expensive treatment options. In some cases, there is a brief time period where a simple procedure can prevent major problems to develop. Dr. Kressin preferably wants to examine the patient before five months age if there is a jaw length discrepancy. An "overbite" or an "underbite" is due to jaw length discrepancy, and these conditions are likely to result in traumatic malocclusions. If primary (baby) and secondary (adult) teeth are present at the same time, action is needed. If dental extractions are performed, they must be performed meticulously. Primary teeth have fragile roots (see photos below) that easily fracture. Fractured root tips must be removed or the benefit of removing the teeth is lost and infection complications may arise. Dental radiography is needed before, during, and after the dental extraction. What are the potential complications to orthodontic care? With all treatment options (surgery or orthodontics), complications can occur. The most common reason for orthodontic treatment complication is failure to evaluate the patient with adequate frequency. Orthodontic care is time intensive, and multiple appointments are needed. Proximity to the veterinary dentist is very important especially when orthodontic treatments are performed. Attempts to move teeth too fast is a common cause for orthodontic complication. Gentle force must be applied to move teeth at the ideal rate. Too much force translates to potential tooth damage (resorption), periodontal inflammation, and even tooth luxation. Inadequate equipment, instrumentation, training and clinical experience can result in complications. Improper use of dental materials can burn the patient (see photo below). 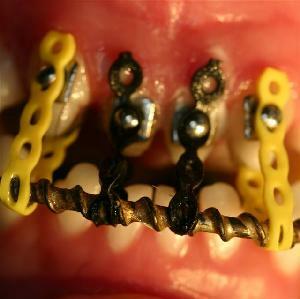 Burn complication resulting from an orthodontic appliance. Painful class 2 traumatic malocclusion is common! striking the palate. Help is needed immediately! needed to perform these procedures. Interceptive orthodontics is a term often used to describe the selective extraction of the primary (baby) teeth to allow for normal jaw length development. This procedure is designed to remove the interlock or "catching" of primary teeth that may prevent normal growth of the jaws. If the animal's genetics are not the cause of having short jaws, removing the interlock can allow normal growth and a normal occlusion. Lance upper canine tooth treated with orthodontic appliances in two stages. with a malpositioned right upper canine tooth. This condition is called spearing or "lanced canine"
or mesioversion of the the right upper canine tooth. exams are imperative to avoid problems. button. We must clean the appliance regularly. Many breeds present with abnormal and traumatic bites. 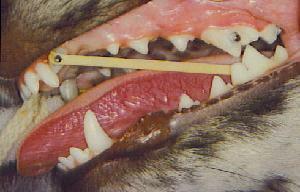 This dog was identified with an abnormal bite before the adult teeth had erupted. Left lower canine punctured the palate (roof of the mouth). 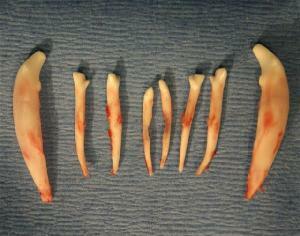 We extracted the deciduous teeth and waited before further treatment. This is critically important. Treatments too early can be devastating for dental and facial development. Have a look below at the treatment. 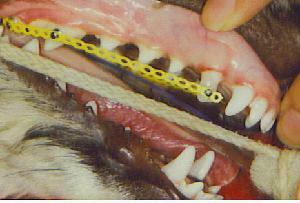 Masel chain (yellow) was placed to move (tip) the upper canines back (distal). 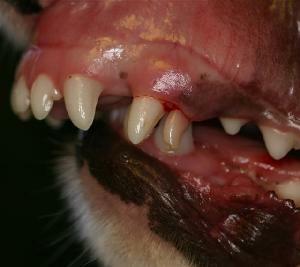 This allowed adequate room for the lower canines to fit into the space between the upper canine and the third incisor. Front view of the bite. Notice that by creating room, the lower canine teeth can fit without causing trauma to the palate. "Base narrow" mandibular canines are common problem in dogs, and can be treated with an "incline plane" orthodontic appliance. Appliance on the right side. Appliance on the left side. Anterior crossbite causing a traumatic painful occlusion. Treated by a maxillary archbar orthodontic appliance. Adult dog with "anterior crossbite". and then adhered to the dogs dental arcade. and second incisor teeth; front view. orientation to direct incisor teeth correctly. to correct the anterior crossbite. Top view of the maxillary archbar appliance. Front view; anterior crossbite resolved. Side view; anterior crossbite resolved.